Gotham Cigars strives to reward its customers for their continued support, and one of the latest ways Gotham Cigars has done so is by offering a great offer on the Djarum Clove Cigars. ...a great way to buy your favorite Djarum flavor while giving you a chance to try a new Djarum product and flavor for free. Gotham Cigars, one of the nation’s largest cigar e-tailers, proudly announces a special promotional offer featuring Djarum brand clove cigars. When customers purchase any $39.99 Djarum upright pack, they will receive a free Djarum Wood Tip 5 pack. 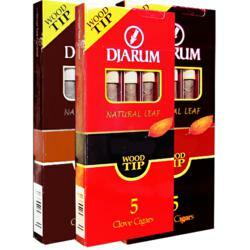 The 5 Pack of Djarum Wood Tip Cigars retails for $5.50. The wood tip pack is available in three tasty flavors—Classic, Rum and Cherry. Gotham Cigars strives to create new offers and deals on top cigars and other cigar products for their customers. Each month, Gotham Cigars features deals that are sent to customers via email, Facebook, Twitter and Google+. These deals range from site wide offers to product specific on high-quality cigars such as Alec Bradley, Gurkha, Cohiba, Arturo Fuente, Swisher Sweets, Phillies and Captain Black. No matter what your favorite cigar is, or if you are looking for a new cigar to try, Gotham Cigars continues bringing new specials each month to satisfy everyone and make cigars more affordable. This Djarum deal brought to you by Gotham Cigars is a great way to buy your favorite Djarum flavor while giving you a chance to try a new Djarum product and flavor for free. Djarum’s signature burn, combined with its smooth taste is some of the many reasons why the brand is coveted in the cigar world. The wildly popular Djarum cigars sell at a high rate, so it is strongly suggested that customers act quickly in order to take advantage of this offer. Gotham Cigars offers its customers one of the country's largest and freshest selections of Premium Cigars, Machine Made Cigars, Filtered Cigars and Humidors. Selling top brands like Alec Bradley, Gurkha, Acid, Phillies, Swisher Sweets and many more has kept Gotham a top pick among other cigar retailers. Gotham Cigars has received five-star ratings by the most trusted online comparison websites for its huge selection, fast shipping and great customer service. Every day customer service is ready to help with any questions or issues its customers have, whether it is a cigar recommendation, an order, or an issue with an order, Gotham is always ready to help. Gotham Cigars has become a favored destination for buying cigars and accessories online in the U.S. Visit http://www.gothamcigars.com to learn more.